Includes a CD with programs, examples, experiments, and data.  Standardization of experimenter effects. At the same time, there are new issues with this new method: experimental control and sampling of participants. Even for those investigators who plan to conduct research in the laboratory with college freshmen and sophomores, the Web is a convenient network for collection of data and for making transparent to other scientists exactly how an experiment was conducted. The advantages in convenience of data processing and for open communication among scientists will cause more and more of behavioral research to be done via the Web. This book presents an introduction to methods and techniques basic to conducting research on the Internet. It will also cover problems unique to this form of research and various ways to handle these potential problems. The book will also teach content and methods of data analysis. Each main idea will be illustrated by examples included on the companion CD. The ideas have been presented in a sequence designed to allow a college sophomore enrolled in Research Methods, a graduate student planning on a first-year project, and a professor of psychology experienced in research (but wanting to learn these methods) to profit from the same book. When studying this book let your computer and the Web be your companions. The CD that accompanies this book contains example HTML, programs, and sets of data. You can follow along with the book by doing the analyses described in the chapter and working with the examples. Many useful links to resources on the Web are also included in the list of examples on the CD. A glossary of terms used heavily in this area of research is also included at the end of the book. The best way to get started with the examples is to load the file, examples.htm, in your browser. That file provides links to the chapter examples. Examples are designed to illustrate both computer techniques and principles of psychological research at the same time. The first four chapters teach basic HTML (Hyper Text Markup Language), use of FTP (File Transfer Protocol) to transfer files, links in HTML, and methods of formatting text and paragraphs in HTML. A novice can study each of these chapters in about an hour each, and should spend about an hour practicing the techniques of each chapter with his or her computer. A college instructor could present each of these chapters in a single 50 min class or lab session, and cover the first four chapters in two weeks, assuming that the students will work with the examples and exercises in the lab or as homework. The reader who already knows HTML and FTP can skim Chapters 2-4, and proceed to Chapter 5, where the excitement begins. Chapter 5 illustrates the use of HTML Forms to collect data from people via the Web. A simple experiment is developed that collects a single response from the reader of the page, who can type his or her answer in a box and push a button to send the datum. This first example illustrates how data can be sent to the experimenter by email. The next example shows how to use a script to append data to a file on the Web. Three input methods are featured; the text box allows the participant to type a number or short answer; radio buttons allow the reader to click from a multiple choice set; pull-down selection lists allow the user select one response from a list. An experiment on the classic St. Petersburg Paradox is presented to illustrate a simple method for assigning participants to different conditions, and also to illustrate how the choices in a pull-down selection list might bias the responses. Chapter 5 requires two 50 min lectures, and it could be covered in class in one week, with students working two hours in the lab. Chapter 6 gives a basic introduction to both Excel and SPSS. Data from the studies in Chapter 5 are analyzed to illustrate the use of Pivot Table Reports in Excel and crosstabs in SPSS. The techniques required to import data, filter them, and work with them in these programs are described. Procedures for calculating a t-test are also described. An instructor could spend either one or two 50 min lectures on this chapter, depending on whether the plan was to cover only one of these programs or both. Students would require two or three hours in the lab or at home to work through the examples in this chapter with their computers. Chapter 7 explains how to incorporate images and define image maps in HTML files. These ideas are illustrated with an experiment and a debriefing page based on the classic Wason (1960) logic problem. Experimental materials and sample data are included on the CD. The data can be analyzed by either SPSS or Excel using methods described in Chapter 6. This brief chapter would require about 20-30 min of class time, and about the same in the lab. Chapter 8 presents basic ideas of decision making research and data analysis. The chapter is intended to make accessible this historical area of psychological research. 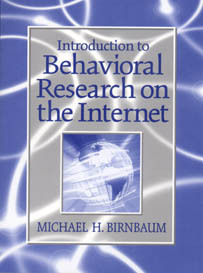 The chapter should prepare an undergraduate to read current work in the field (Birnbaum, 1999), and design his or her own Web studies in the field. Both the experimental materials and sample data are included on the CD to facilitate this process. These chapters build on and consolidate ideas presented in Chapters 1-6, showing how those ideas alone are sufficient to conduct interesting research. An instructor may choose to present only one of Chapters 7 and 8, depending on the student level. Chapter 8 is the more difficult in terms of psychological content, requiring at least one 50 min. lecture, and two lectures, if theories beyond Expected Utility theory will be covered. Chapter 9 explains how to use surveyWiz, computer software included on the CD, to make simple surveys and questionnaires. With this software, a person with minimal background can quickly make a simple survey, questionnaire, or personality test that will run on the Web. The chapter also illustrates an example of a between-subjects study of judgments of the "size" of numbers, to show how between-subjects designs can lead to the conclusion that 9 is a "bigger" number than 221. The chapter describes contextual effects in judgment that are important to interpreting results of between-subjects designs. Chapter 10 presents another example of the use of surveyWiz, showing how to construct and evaluate a personality test. The chapter explains how to make the HTML for the personality test (which is also included on CD), and how to analyze data from a personality test. Data, included on the CD, are analyzed by correlational analyses, including factor analysis, to examine the factor structure of the test and the internal consistency of the scales measured. Chapter 11 explains how to use factorWiz, additional software included on the CD, to make within-subjects, factorial experiments. The software constructs the factorial combinations, randomizes order, and prints the HTML form. Several examples of factorial experiments are included on the CD. Chapter 11 illustrates how to use the program by constructing a factorial design of all pairs of adjectives from two sets, to test a theory of impression formation. Chapter 12 covers the topic of impression formation, showing how to analyze the data from a factorial design to determine if the whole is equal to the sum of its parts--in other words, if there is an interaction between two factors. This chapter covers the additive (or constant weight averaging) model of impression formation, and methods for the graphical and statistical analysis of interactions. Chapter 13 discusses Heider's (1946) theory of balance in social relations. This chapter contains some material (Sections A-C) that is designed for undergraduates; later sections of the chapter contain material for the advanced student. An instructor might plan to present Sections A-C to undergraduates and the entire chapter to graduate students. This chapter illustrates a very powerful type of interaction, yet one that is compatible with a simple model. The advanced material shows how to use Excel to fit a model to the data and evaluate the fit of the model. Chapter 14 explains how to include psychophysical stimuli, and it also illustrates a relevant use of the HTML technique of Frames. Methods for working with graphics and sound are also presented. This chapter forms a bridge between Chapter 11, which explains how factorial designs can be created and Chapter 15, where "ratios" and "differences" are used in scaling. These methods of scaling have been most often applied in psychophysics, but are also applicable to study of social variables such as the prestige of occupations, the stressfulness of life changes, or the badness of crimes. Chapter 15 discusses the use of "ratio" and "difference" judgments to scale psychological stimuli (illustrating the topic with data for judgments of the prestige of occupations). This chapter contains material that is best suited for advanced students or students looking for project ideas. Chapter 16 discusses Bayes Theorem as a descriptive theory of human inference. Like Chapter 13, this chapter can be covered at the undergraduate level in Sections A-G, or the entire chapter for advanced students. Each of Chapters 10, 12, 13, 14, 15, and 16 could be the topic of one or two 50 min. lectures, depending on the depth of coverage. Each would require about 3-4 hours of lab work or homework by students to follow the analyses. Each of these chapters would make good starting points for a student project designed to go beyond what is in the chapter. Chapter 20 discusses advanced techniques used in cognitive psychology experiments, including Authorware/Shockwave and Java programming language. Finally, Chapter 21 discusses methodological and ethical issues in Internet experimentation, and presents ideas of how to recruit participants on the Web. This chapter could be treated at the review level in one 50 min. lecture. Each of the topics reviewed in the chapter could be the basis for an entire course, if handled at the advanced level. This chapter is also a good source of ideas for student projects that emphasize computer techniques. Appendix A describes the program Polyform, which creates scripts that process the data, organize them, place them in a file, and send the reader to a Web page that delivers a thank you message. Novices and students who will use a canned script provided by their Internet Service Provider or instructor can skim this chapter. Those who plan to write their own scripts can also skim the chapter, but should look at the examples and linked resources. Information for instructors in using the book (also from the preface) is available here.